The Connetquot Teachers Association (CTA) was recently notified that three members of the association had been singled out by Senator Caesar Trunzo (R-Brentwood) as outstanding teachers. As part of the National Teacher Day celebration Trunzo awarded Certificates of Appreciation to Ms. Jane Murphy (Edith L. Slocum School), Ms. Carol Pustay (Idle Hour School) and Mrs. Agnes Gaeta (District Mentor - Connetquot HS). Jane Murphy is the Literacy Collaborative Coordinator for the Edith L. Slocum Elementary School. She is also a mentor to her fellow K - 2 colleagues and provides in-house teacher workshops. Jane's dedication has made her a role model to other Connetquot educators. Carol Pustay is a reading teacher at the Idle Hour School. Her dedication goes a long way towards helping the Idle Hour School maintain it's title as a Suffolk Honors School. Carol coordinates all of the NY State Assessments and Evaluations, serves as a building mentor and has earned the respect of all those who meet her. Agnes Gaeta is the District Mentor for the Connetquot School District. Agnes began her teaching career at Holy Trinity HS in Hicksville in 1972. She moved to the Connetquot School District as an English teacher in 1979. As the District Mentor since 2004 Ms. Gaeta has worked with the newest teachers in the district, providing encouragement and sharing her extensive experience as a classroom teacher. 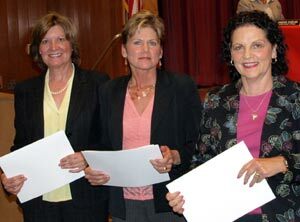 The CTA congratulates Jane Murphy, Carol Pustay and Agnes Gaeta for having been honored by Senator Trunzo as Outstanding Educators in 2008. These professionals are role models for all Connetquot teachers, and a source of pride for the membership of the Connetquot Teachers Association.